Much like Up, Inglourious Basterds is on my list because of the opening scene. Christoph Waltz is brilliant as "The Jew Hunter," Hans Landa. If we don't see Waltz holding up the Best Supporting Oscar trophy this year, it will be the Academy's most egregious error since Saving Private Ryan didn't win Best Picture. The only question might be whether he's only a supporting actor. Is Brad Pitt the lead? I think that Waltz is probably in this movie more than Pitt is. I'm still blaming Pitt for the really crappy Benjamin Button, but he's pretty good in this as well. He might get that Curious Case of stink off of him sometime soon. He's actually great in every scene he appears in, but the opening is his showcase. It sets the mood right up front that moves through the rest of the movie. I could easily see this scene showing up as a one act play. I dread watching that high school production, but at least Waltz's performance will be ready to wash it away. To understand and appreciate music, especially classical music, one must be able to appreciate tension and release. Great music builds you up to a point where you almost can't handle it anymore, but gives you the critical release. That's also the key to some other things in life, but kids read this, so use your imagination. Quentin Tarantino gives a clinic on tension and release in movies. Each scene, not just the first one, is its own short film. Each scene gives the characters reason to squirm. But more importantly, so does the audience. While you might not like the way he releases the tension, but he does. 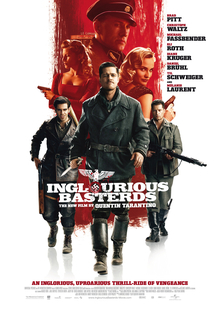 Honestly, I haven't read or heard anything really negative about Inglourious Basterds from anybody who I consider to be intelligent. I guess, in that case, if you've been around me and had bad things to say, that tells you what I think. If anything? It's too long. However, since you can view it like a bunch of individual films, it will be easy to watch on DVD. You can easily break it into parts and still be satisfied. The idea of the opening scene as a one-act play is so perfect that I'm almost angry I didn't think of it first. I wish I were still going to high school so I could be the one to butcher it myself. Do it and post it on Youtube. Make sure Kesler plays the Jew Hunter.